Adm. John M. Richardson testifies at the Senate Armed Services Committee on Capitol HillThursday, July 30, 2015. The committee is considering the admiral to be the Chief of Naval Operations. When the A two-month gap in carrier presence in the Middle East this fall after the carrier Theodore Roosevelt leaves the Persian Gulf this fall, U.S. Central Command will be without a flattop for as long as two months even as airstrikes continue against the so-called Islamic State militants. However, the fleet will have other warships there to continue missions as a sign of the Navy's continuing commitment, will reduce the capabilities of the Navy brings to the fight against ISIS, but the Navy remains committed to the region, the officer nominated to helm the service told lawmakers Thursday. Navy's prospective top officer said Thursday at a confirmation hearing before a Senate panel. In a tense exchange that opened the hearing, Adm. John Richardson told the chairman of the Senate Armed Services Committee that the gap in presence in the middle of the ISIS fight with ISIS was a setback, the result of maintenance continuing backlogs created by budget cuts, but that the Navy would continue to be forward in the region. "The overriding message is our firm commitment to naval presence in the region," Richardson said, before Sen. John McCain, R-Ariz., cut him off. "The absence of a carrier doesn't really authenticate a commitment," McCain replied. Richardson ultimately conceded that the missing carrier would reduce the Navy's effectiveness in the fight. "Without that carrier there will be a detriment in our capabilities there," Richardson said. The gap in presence was first reported by Navy Times in June. The exchange was the exception to a generally one of only a couple of tense moments in a largely warm and receptive confirmation for the chief of naval operations nominee, who must be confirmed by the Senate. The hearing before the Senate Armed Services Committee, which concluded with chairman McCain telling Richardson that he would move to have him confirmed before the Congress's "ill-deserved" August vacation. The hearings covered a wide range of topics, including combat integration. Richardson told Sen. Kirsten Gillibrand, D-N.Y., he would work with Navy SEALs to develop a plan that would maintain "mission effectiveness." "I look forward, if confirmed, to getting very involved with Special Operations Command to make sure we give everyone a fair opportunity," he said. Gillibrand also pressed Richardson on the Navy's handling of sexual assault cases and retaliation against victims, and told Richardson that the Navy needed to do better at bringing more cases to trial, which Richardson committed to working toward. "I can't think of anything more toxic to teamwork than an insider threat that preys upon the confidence between team members," he said. Richardson was also pressed on the Iran nuclear accord and whether he supported the administration's talking point that the alternative to the recently signed nuclear agreement was war. Richardson, who currently oversees the nuclear Navy as the director of Naval Reactors, said that the foremost mainmission of the armed forces and the Navy was to deter war and, ultimately, acknowledged that there were other options than going to war with Iran. Notably absent from the proceedings was any mention of his controversial comments at last year's Sub League conference, where he urged the audience members to call Congress and press for funding next generation boomers. and communicate the need for funding the next generation of ballistic missile submarines. The comments resurfaced in June when a watchdog group asserted Richardson was illegally lobbying for the program, a charge that prompted an IG investigation. The IG cleared him was cleared of wrongdoing in late July, ahead of the hearing. Similarly, there was no mention of his leaving an eight-year billet after just three years in the seat as head of Naval Nuclear Propulsion — a move that caused great consternation at Naval Reactors among purists who fear that one of the military's most important and long-term posts NR billet will become a stepping stone holding cell for rising four-stars that compromisesing the Navy's outstanding nuclear safety record. Long deployments: Richardson said he would continue current CNO Adm. Jon Greenert's push to drive down deployment lengths and make them more predictable for families. 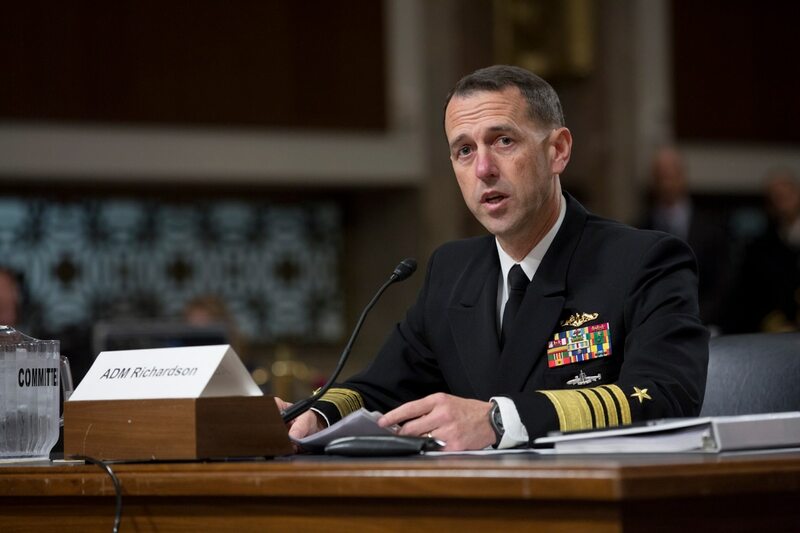 "In my experience, the dominant factor that is negatively affecting our Sailors' professional experience in the Navy, and the stress that their families experience, is the frustration associated with things like delays to getting underway, deployment extensions, training delays and gaps, delays in maintenance periods, and last-minute parts availability," Richardson wrote. "These avoidable unpredictabilities are the single biggest detractor to quality of service." Reigning in deployments, Richardson added, is that went on to say later that was essential to keeping sailors in the Navy. "Central to recruiting and retaining high quality personnel ... is our ability to provide Sailors deployment predictability and the resources necessary to carry out their mission," he wrote. Accomplishing that means contending with the headache hydra of budget cuts, unforeseen maintenance delays and unceasing demand for warships overseas. Rising costs: For the past two budget cycles, leaders have struggled to find savings by slowing the growth of health care costs and cost of living subsidies. Richardson said he supported slowing the growth of compensation and health care costs, providing the reforms still met sailors' expectations to be fairly paid. "If communicated properly and put in the appropriate context by leadership, slowing growth, while still meeting expectations regarding those matters that Sailors and their families value most, should allow the Navy to make appropriate adjustments in a controlled and sustainable manner," he wrote. Tuition assistance: Richardson said he doesn't see any need to change to current tuition assistance system, but said he would support some changes in the future, including making reimbursements more targeted. "As long as we do not become too restrictive regarding our definition of what 'contributes to a Sailor's professional growth,' I believe that Navy-funded education should both enhance the professional growth of our people and the effectiveness of our Navy," he wrote. "As with other personnel programs this will have to be closely studied and thoroughly communicated in order to achieve the desired positive effect." Military pay and retirement: Richardson came out in support of retirement reform and reforming the commissary and exchange systems to save money. "I support proposals to modernize our retirement system so long as our Sailors are given supporting education to make choices to best support their families," he wrote. "My inclination is that the [Military Compensation and Retirement Modernization Commission] recommendation to combine some commissary and exchange functions make sense; I would like to study this more closely." If confirmed, Richardson will is set to turn over with Greenert and assume the Navy's top uniformed job as early as September. Jennifer-Leigh Oprihory contributed to this report.